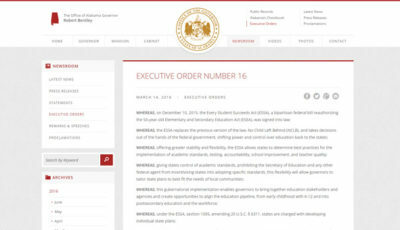 The U.S. House of Representatives overwhelmingly approved the Every Student Succeeds Act (ESSA), the replacement for the 14-year-old No Child Left Behind Act, by a vote of 359-64. All 64 no votes came from Republicans. Alabama’s representatives were split: four voting yes, and three voting no. The bill, a bipartisan compromise between previously approved House and Senate versions, is expected to be on the Senate floor for a vote on December 7. Rep. Martha Roby, R-Montgomery, (press release): Roby earlier introduced a bill prohibiting the U.S. Department of Education from coercing states into “adopting its preferred policies, standards or curricula” through grant funding or other rules. 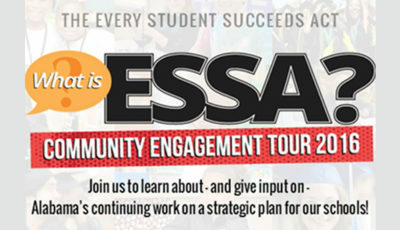 ESSA does that, and Roby considers it a “significant accomplishment”. Roby wanted whatever replaced NCLB to go further than ESSA does in restricting federal intrusion into state’s K-12 arena, but “the bill as it stands presents a can’t-miss opportunity to reduce the federal footprint in education”. Rep. Terri Sewell, D-Birmingham, (press release): Sewell said, “The bill reduces the amount of standardized testing in schools and empowers educators to have a stronger voice in classroom decisions. 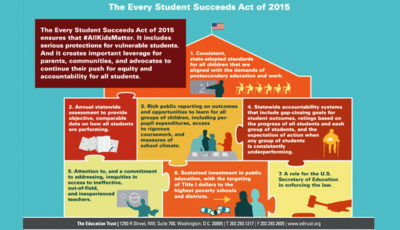 The Every Student Succeeds Act is a promising improvement over current law as this bill protects the millions of minority, disabled, and disadvantaged students we were sent here to represent.” Sewell, saying that ESSA is “not perfect”, nonetheless said the bill represents “great progress” over the outdated NCLB. 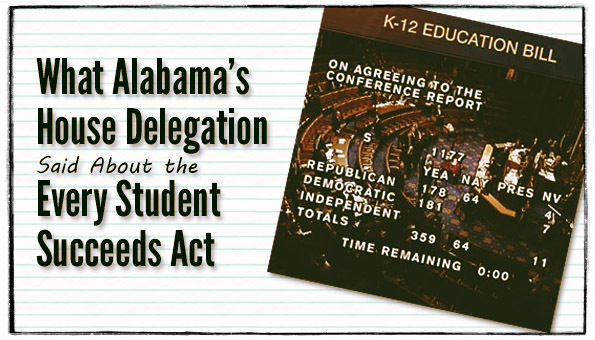 Rep. Bradley Byrne, R-Fairhope, (press release): Byrne, once a member of the State Board of Education, said ESSA limits federal involvement and empows individual states and school districts. 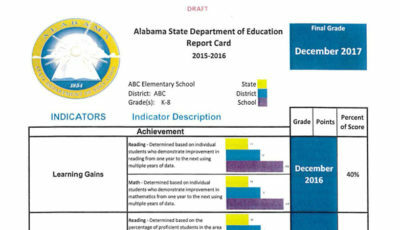 Like Roby, Byrne sought to limit the ability of the U.S. Department of Education, specifically the Secretary, to coerce states into adopting specific standards, using the example of the Common Core State Standards. “This bill expressly prohibits the Secretary of Education from influencing or coercing states into adopting Common Core. The bill makes clear that it is solely a state’s responsibility to set academic standards and assessments. These restrictions on the federal Secretary of Education are unprecedented and will end the Secretary’s ability to influence education policy through executive fiat and conditional waivers,” Byrne said. Rep. Robert Aderholt, R-Haleyville, did not issue a press release. A call to Aderholt’s D.C. office was not returned before press time. This article will be updated when we receive a response. Aderholt is the only one of Alabama’s representatives that held the office in 2001. He voted for the original NCLB Act in 2001. Rep. Mo Brooks, R-Huntsville (press release): Brooks said that while ESSA represented “meager steps in the right direction, it retains annual testing requirements, funds pet education projects of federal lawmakers, and creates even more new and intrusive federal education programs that will be very difficult to eliminate in the future.” Brooks added ESSA continued the federal requirements that “divert local school funding from the classroom to costly and unnecessary central office reporting bureaucracies that do not help teach a single student a single thing”. Calling NCLB a “complete failure”, Brooks said that rather than passing ESSA, Congress should “let NCLB die a much needed natural death”. Rep. Mike Rogers, R-Saks (press release): Rogers voted no because ESSA didn’t “shrink the size and scope of the Federal government’s involvement in primary and secondary education,” believing that federal testing requirements intrude into local and state education officials’ authority. “Parents, teachers and local officials in East Alabama should be able to determine the best way to approach the learning process and learning pace,” he said, adding that he was disappointed that the House passed ESSA. Rep. Gary Palmer, R-Hoover, did not issue a press release. A spokesperson for Palmer said his primary reason for voting no was because he was not in favor of creating a federal $250 million preschool program in the bill, adding that Palmer wasn’t in favor of the annual testing mandates either.